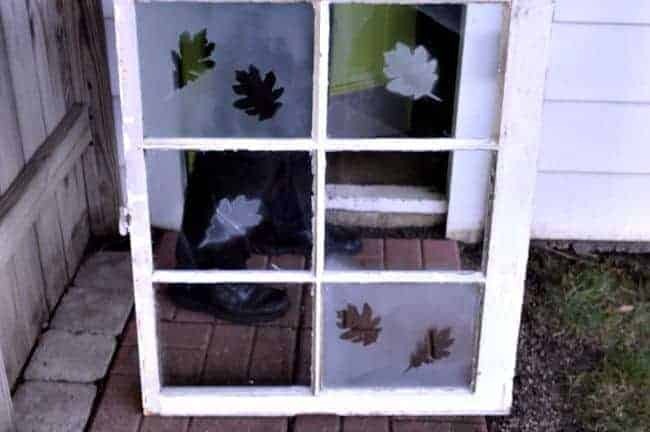 Today I have a fun, quick, easy and ridiculously cheap craft (my favorite kind of DIY) that you can do with an old window. I bought this old window months ago thinking that I would turn it into a chalkboard for the large blank wall in my kitchen. It sat in the garage collecting dust and waiting for its makeover when I spotted a vintage, solid wood mirror at my local ReStore for a mere $10. As soon as I spotted it I knew it would be perfect on the same kitchen wall I had in mind for the old window, after a date with my paintbrush and some chalkboard paint, of course. 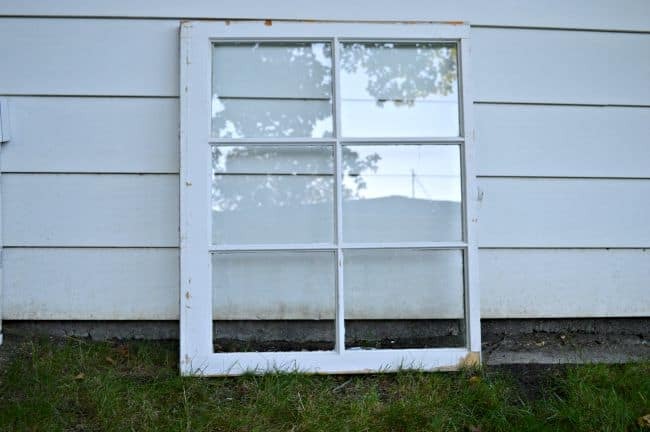 Now that my plans had changed, I wasn’t quite sure what I was going to do with the old window. Should I add a shelf and hang it on a wall? Maybe find a place for it outside and hang it on the garage wall? I wasn’t sure, so I just gave it a good cleaning and brought it inside. I had recently moved the starburst mirror that hung over the black cabinet in the dining area and the wall was empty, so I plopped the window up on the black cabinet and leaned it against the wall. 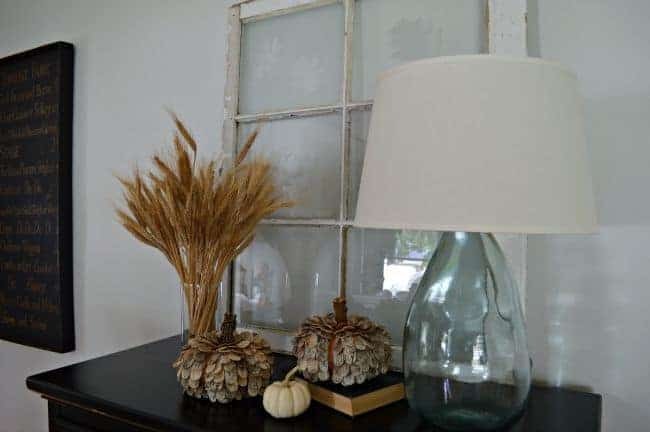 As I was decorating the cabinet for my fall home tour, I kept looking at the window, trying to figure out what to do with it, when I had an idea to stencil some fall leaves on the panes as a temporary fall decoration. 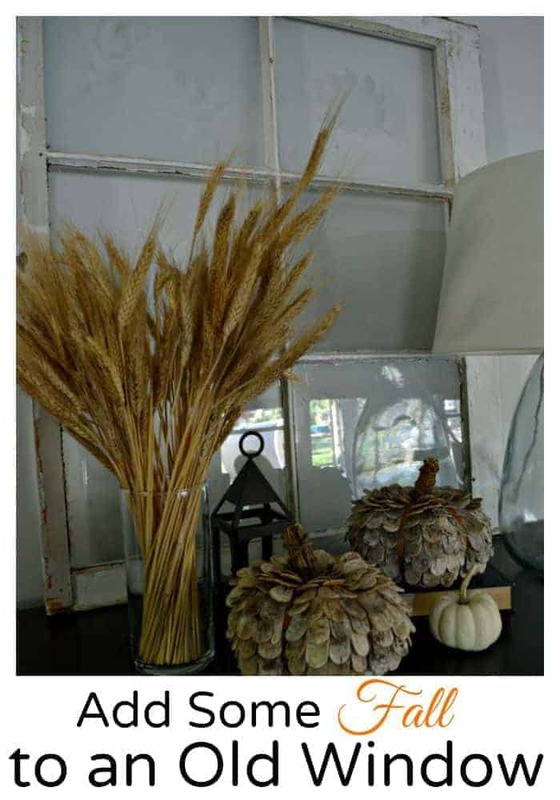 My plan was to use Rustoleum frosted glass spray paint and a leaf stencil to add a subtle touch of fall to the old window. 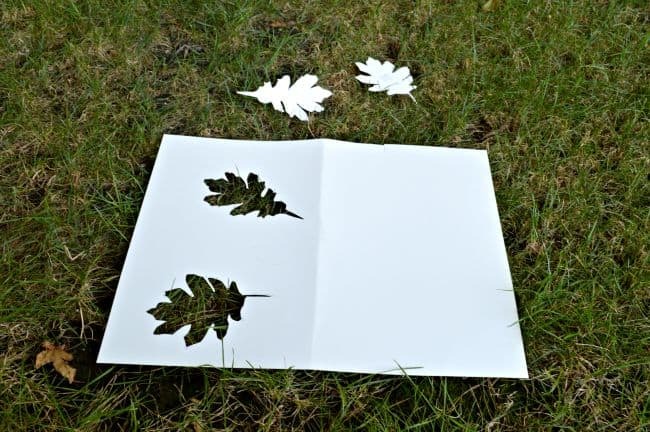 To make my stencil, I traced two artificial leaves, I was using for decoration, on a stencil board. 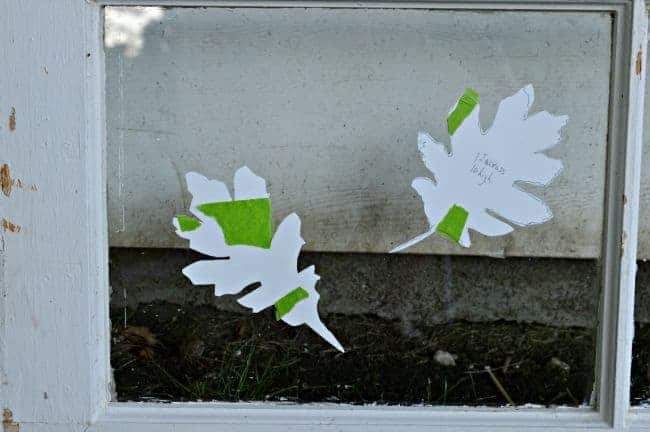 I used both the leaves and the cutouts to make it a little more interesting. I just taped the stencil on the glass pane and sprayed a light coat of frosted glass. Then, I carefully pulled the stencil off so I wouldn’t have any sticking issues. I had some overspray with the solid leaves so I just used a razor and scraped it off, once the paint was dry. There’s so much you could do with the stencils but I was going for subtle, as usual. 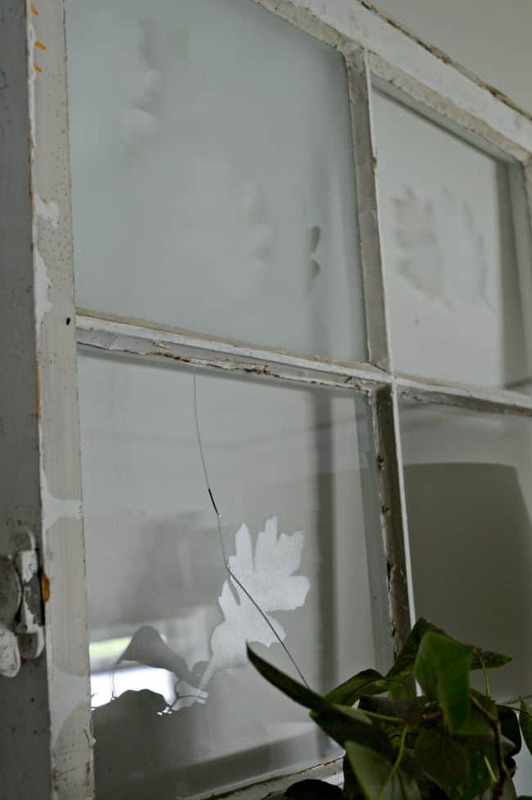 I did go a little wild and tried some silver spray paint on the cracked middle pane. It’s still subtle but I like the little bit of sparkle. To give you a better look, here it is in my guest bedroom against the teal blue wall color. 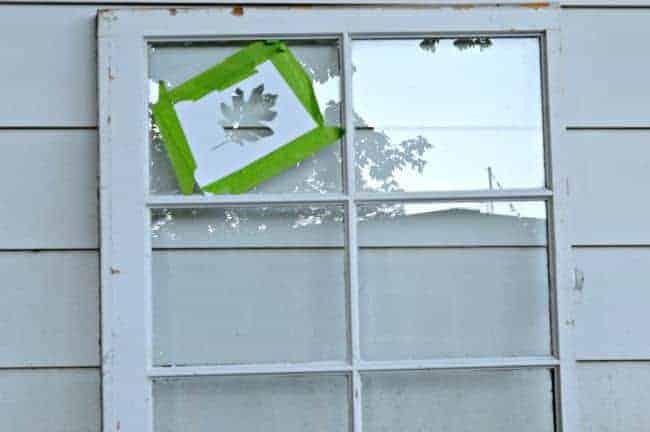 The leaf in the second row on the left is painted with silver spray paint, while the rest are with the frosted glass. The beauty of this is, when I want a change, all I have to do is scrape off the paint with a razor blade. Maybe I’ll add some snowflakes when I decorate for the holidays. Ugh, I know I’m not ready for that yet! I like the subtle, frosted look! Great job! Very Cool and simple…would be tempted to spray some orange just for fun…too. Thanks for the great Idea. Thanks Sandi. I’m so glad that you liked it, and I think that trying orange is a fun idea. Thanks Nancy! I discovered the spray during the summer and I think I’m a little obsessed with it. 😉 I bet Dennis’ paintings look absolutely beautiful in your new home. Can’t wait to see what you’ve done. Thanks for dropping in Jessica and I hope you have a great weekend! Oh, I love it! Now i don’t know what I’m going to do with my window pane. 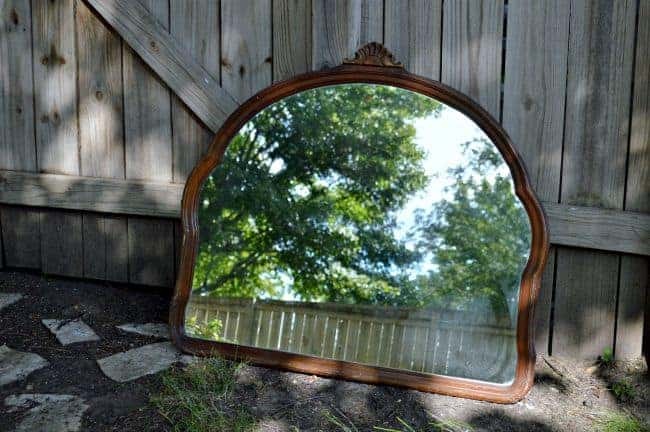 Mine has mirrored glass in it and I originally was going to use it on the side of my tool shed (I have two), but after talking to you and looking at the backing I don’t think it’s such a good idea. So I decided to use both of them (or as my grandson says,”Two a dem”) in the house. I was going to paint the panes with chalkboard paint and use the the attached planter as a place to hold the chalk. Now I’m thinking maybe I should use the frosted spray paint. Oh, dilemmas, dilemmas. Unless I do one with the chalkboard and the other with the frosted paint! That would work, right? Thanks! By the way, love the antique mirror! What a find! Thanks MJ, I appreciate it. I remember you asking me about your mirrors. 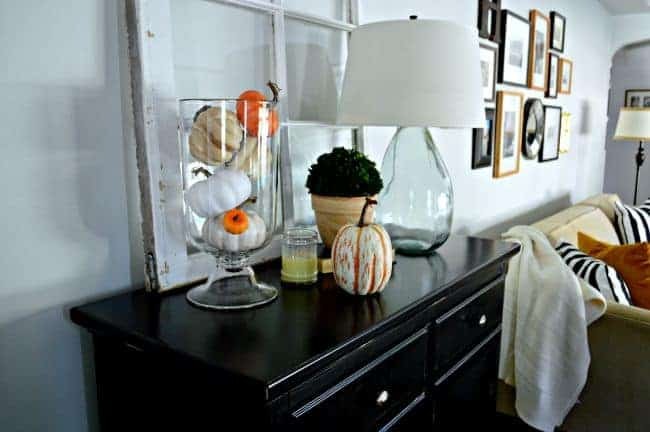 You could do one with chalk paint and another with frosted paint. The great think with the frosted paint is that you can scrape it off if you don’t like it or you want a change. Keep me posted on what you decide. Thank you Vel, I appreciate it. Awww, thanks so much Debbie. 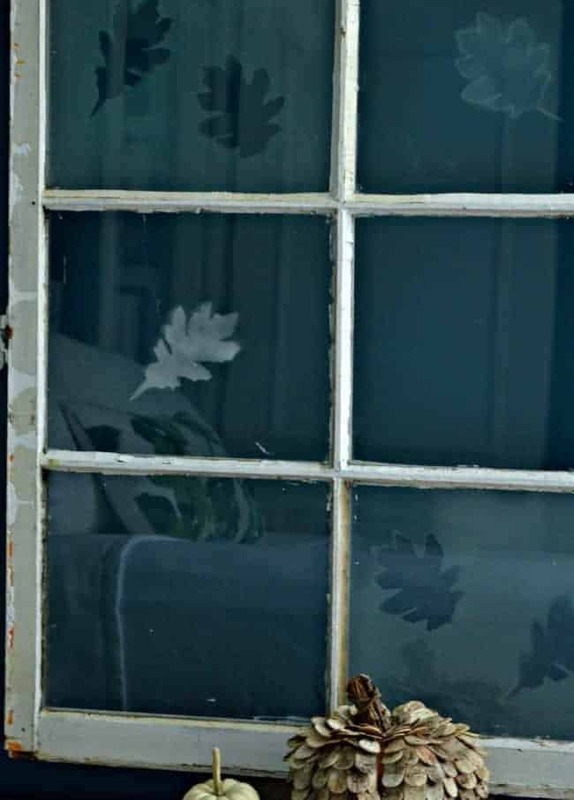 I know that old windows can be really expensive. I got a deal on this one but it took me a really long time to find. Keep looking, it’s out there somewhere. 🙂 Have a great weekend! Very nice! And I bet it is even prettier in person. I have used Krylon Matte spray varnish and it frosts nicely. I, too, love the pumpkins. I guess you could use pine cones but that seems a bit tedious. Can’t wait to see what you have come up with. I’m glad you like the pumpkins. I think they’re awesome. I love that! You are queen of the crafty spray paint ideas. I need some old windows now! You came up with a very cute idea! I bought 2 from Target tonight, thanks for sharing, love them to pieces, made from birch bark, too cool.